New York City Hotel Is a Lower Manhattan GemAll the excitement, power and history of New York City seem to gravitate around the Holiday Inn Hotel New York City - Wall Street. After all, we are close to the engine that drives the country's economy: Wall Street.Just blocks from the Financial District, our hotel is also only a short walk from many other amazing sights, such as City Hall, Battery Park and the World Trade Center. Our hotel's Lower Manhattan location puts you just a mile from the ferry that takes you to the Statue of Liberty and Ellis Island. Little Italy, Chinatown, SoHo, the Brooklyn Bridge and Tiffany & Co's Wall Street store are also a quick walk from the hotel's front door.Lower Manhattan business travelers find that we're within blocks of the New York Stock Exchange and the Financial District. Our hotel has free high-speed, wired and wireless Internet access, so you can keep on top of work and the latest news. 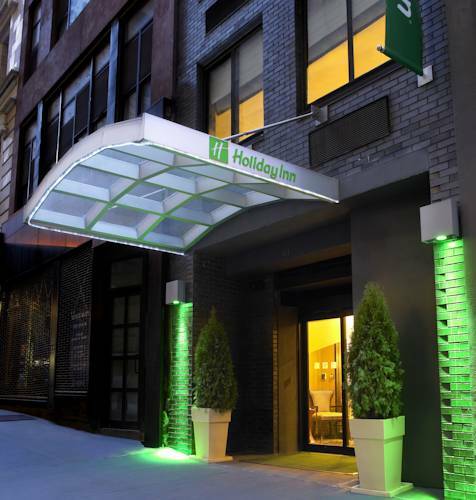 When you stay at the Holiday Inn Hotel NYC Wall Street, you'll be close to many of the city's major subway lines, making it a "piece of cake" to get to your meetings on time. The Business Center is open 24 hours, so you can be ready for anything in the Big Apple.After a day of meetings or sightseeing, The BullPen Bar & Grille is a great place to relax and enjoy delicious food and specialty drinks. Stay with us on your next trip to NYC and experience the comfort and convenience of this terrific hotel! Huge department store offering huge discounts on European and designer labels, located around the corner from hotel. Ask Front Desk about "FREE GIFT" coupon. Shopping for that special someone? Visit the renowned jewelry store's beautiful downtown location featuring two floors of remarkable architecture, stunning decor, and gorgeous pieces. Service to upstate NY, Long Island, Philadelphia, Washington DC, and other major cities.